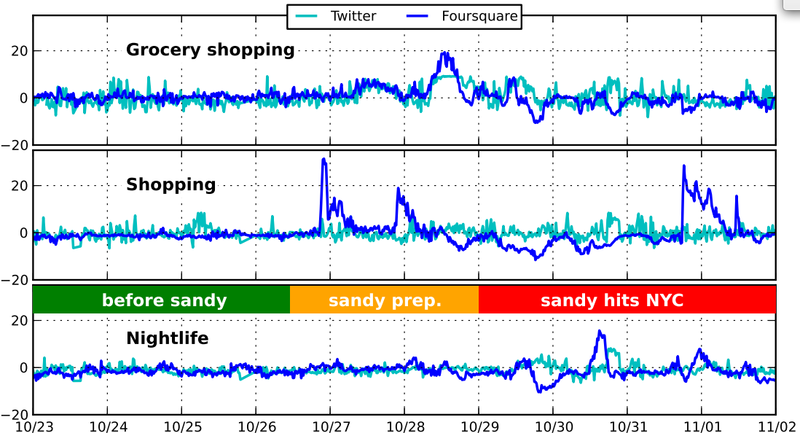 “When rare events at the scale of Hurricane Sandy happen, we expect them to leave an unquestionable mark on Social Media activity.” So the authors applied the same methods used to produce the above graph to visualize and understand changes in behavior during Hurricane Sandy as reflected on Foursquare and Twitter. The results are displayed below (click to enlarge). Now if only this applied research could be transfered to operational use via a real-time dashboard, then this could actually make a difference for emergency responders and humanitarian organizations. See my recent post on the cognitive mismatch between computing research and social good needs. This entry was posted in Big Data, Crowdsourcing, Social Computing, Social Media and tagged #Sandy, Foursquare. Bookmark the permalink. “Now if only this applied research could be transfered to operational use via a real-time dashboard” — we’re on it. Excellent, many thanks for reading & commenting. Would be great to connect.